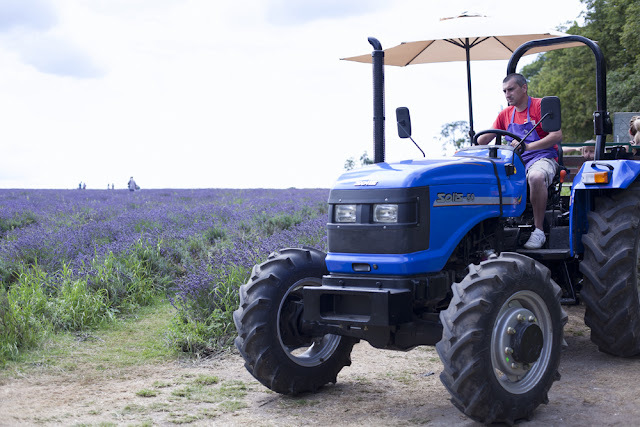 I had been meaning to go to Lavender Fields which is based in Bansted in Surrey for quite a while. So a few weeks ago we got a nice day and decided to go. We did have a bit of a night mare getting there. After google telling me... wait scrap that... lying to me and saying it was one train journey to one stop from my home and then a 10 min walk, it actually ended up becoming a one stop train journey and a hours walk. I got there and this time instead of using google, I put the address into google maps. Apparently a 45 min walk from the station. I was about to head back and instead I thought I would ask directions. Here I was lied to for a second time. Two very friendly ladies told me it was a 20-30 min walk in a straight line in one direction. So I thought to myself, that's okay. I can manage that. 20 min into the walk and I'm not there and instead i'm at a dead end where the path ends and it becomes road only. Great. How am I meant to walk down there. So I wait and finally ask a passer by. He tells me that if I cut through the tree's on the other side of the road I will find a path to take me there. So I think I've come this far I may as well keep going. Get to the end of the woodland road and then there are 2 turns... okay which way do I go? No one told me about turns. I wait again and finally another passer by sends me up a long path which she says is a 15 min walk and I will be there. She was correct. Only I was then at the back entrance with 2 stiles to go over and here I am with a pram. Lily is really cranky at this point as its hot and she has been in the pram for ages. So as I take her out the pram and lift her over the stile she suddenly starts to cry hysterically because she seems to think I'm not coming over with her. There wasn't much I could do and had to lift her over each stile and then the pram and it took me a good 30 min after that to settle her. It was £1 entrance which wasn't bad to pay. When you look across the fields all you can see is purple. Its beautiful. 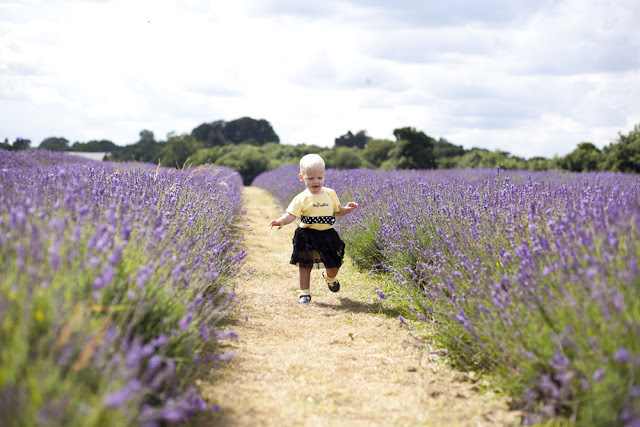 The fields are huge at 25 acres and there are loads of openings between the lavender so then you can walk between it all. We went for a lovely long walk around them all while I was trying to calm Lily down. 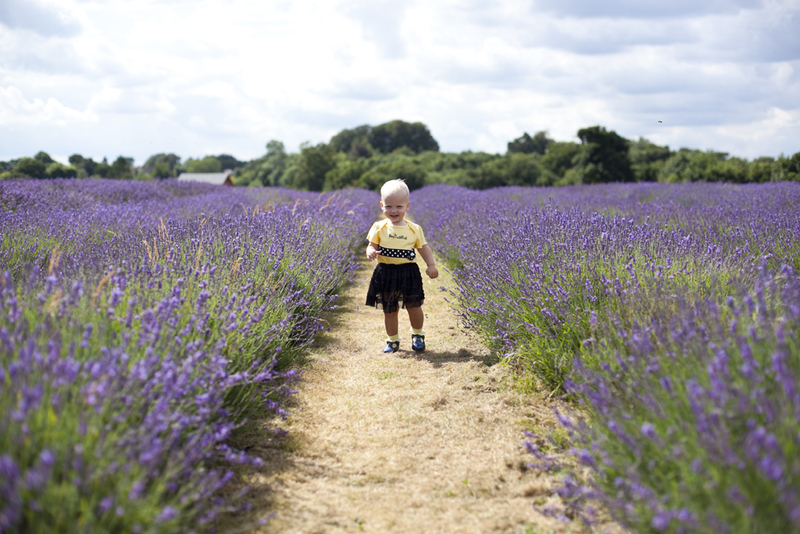 We went to lavender parks in late July. Apparently to see the lavender at its best you need to go at the start of July. The lavender is around until the end of august though. Lily finally cheered up and seemed excited and interested to explore the lavender. I had dressed Lily in her little Bee outfit as I thought it was a fitting little outfit to wear amongst all the other Bee's all hard at work. Lily didn't seem to phased by all the bee's buzzing around her which surprised me actually as she see's a little fly in the house and she suddenly starts shouting bee bee. 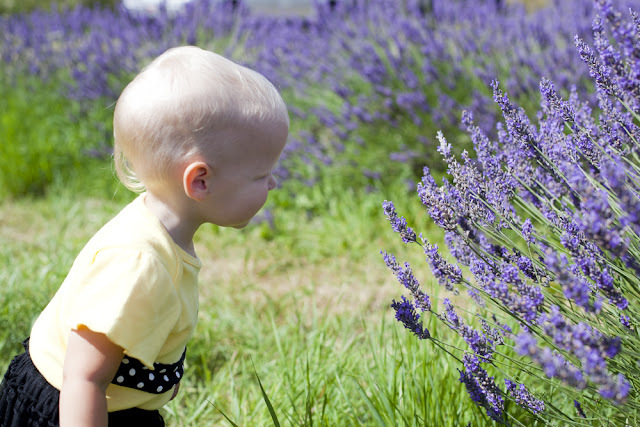 She happily walked in and around the lavender but didn't seem to want to go to far away from me and so kept around the edge of the little path ways. 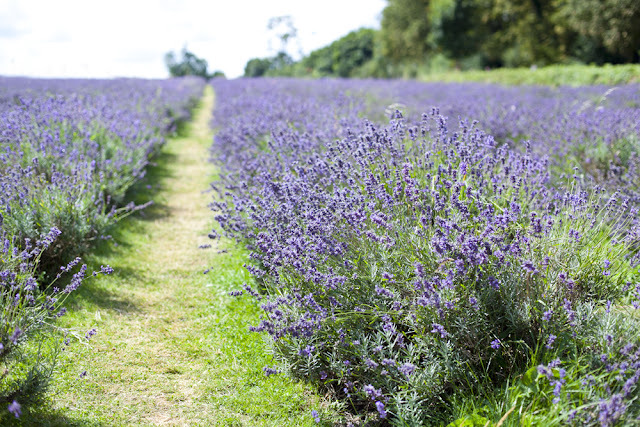 The lavender smelt beautiful. 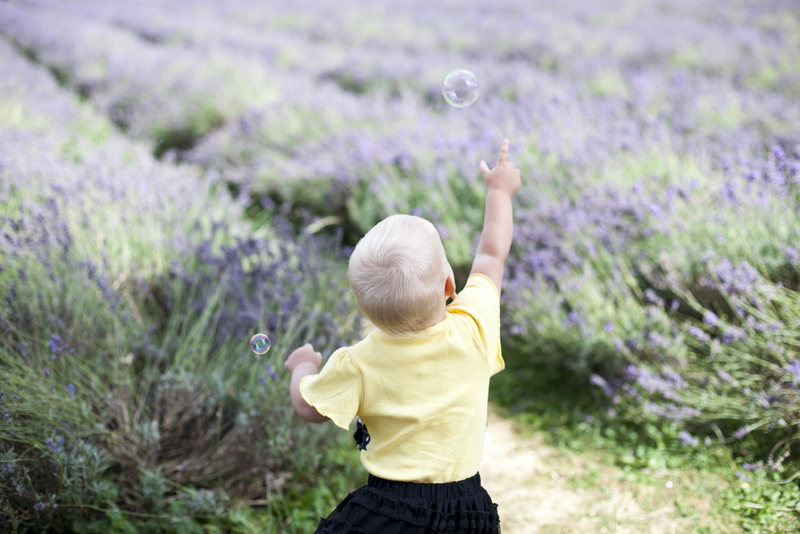 I'm sure you all know what lavender smells like so just imagine being outdoors and being able to smell that smell all around you. Its amazing. I taught Lily how to smell by sniffing and so when I said to her smell the flowers, she leant over and gave a bit sniff of them. Lily was really impressed to see that there was a tractor with a wagon on the back taking people around the field. Lily hasn't seen a tractor before and so she was quite amazed! We didn't go on the tractor this time as we had the pram with us and also I didn't have any change to pay the fee to ride on it. The fields are also full of wildlife flying around. There is a huge bee hive and you see a bee every second here. If you are frightened of bee's then this isn't the place to go. Although I must say that it could help with your fear because you will see that they are no threat. Not once did a bee come near us while we were there and they even let me get close enough to take a photograph. 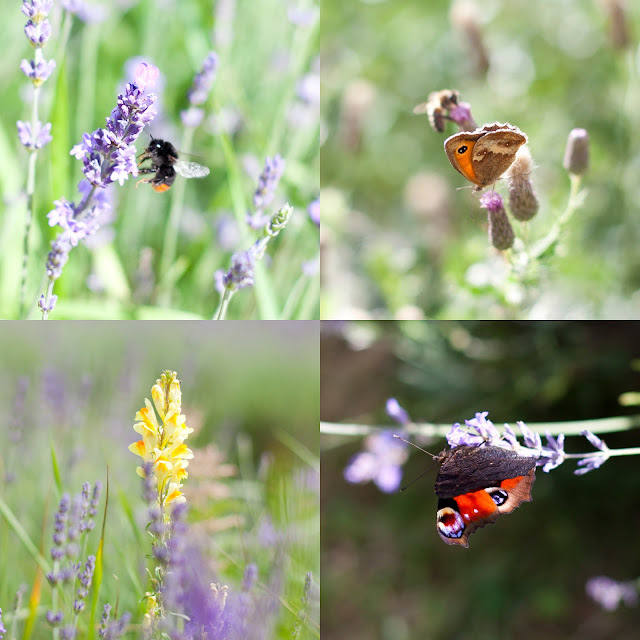 There were also loads of beautiful butterflies flying around. All different sizes and colours. Now what I didn't realise is butterflies are very hard to photograph haha. I managed to get some pictures but I was literally chasing them all day to get them. As well as the lavender you would find some odd yellow flowers dotted around the field which looked lovely with the purple. One plant I wasn't to keen to see there though was the nettle. I got stung and I was very frightened of Lily getting stung due to her not having anything on her legs. Me and Lily then decided to play a little game of chase through the lavender. She really enjoyed this and was giggling in hysterics and it was really nice to see her adventure a little more into it all. This definitely tired me out if not her and after this we both needed a sit down and nice cold drink. A Lovely way to end the day was to make a new friend. As we were sat relaxing enjoying our drinks a lady got her daughter some bubbles out. Lily is a sucker for bubbles and wasn't going to just sit there and watch and so had to run over and join in playing with the bubbles. That's one thing that kids are great for, they really help you get talking to strangers and thanks to Lily I got chatting to the parent of the other child and we really got on. We are soon to meet up for coffee and to let our little ones play together which i'm really happy about. Just before we left to catch the bus. (Yes, there's a bus, wish I had of known that on the way there grr) We headed to the shop. 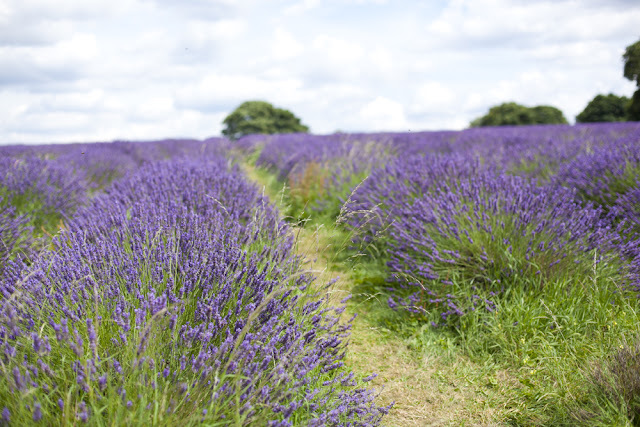 They sell all sorts of lavender products and also sell bunches of fresh lavender. I bought some dried lavender in a bag to hang in my bathroom and a magnet with lovely photograph of the fields on. I like to buy magnets to remind me of the places I have visited. You still have a little time to still visit the fields if you wanted. You can head to the website here to find out exactly where it is. Its open from July to end of August and open 7 days a week from 9am with the last entry being at 6pm. Beautiful! 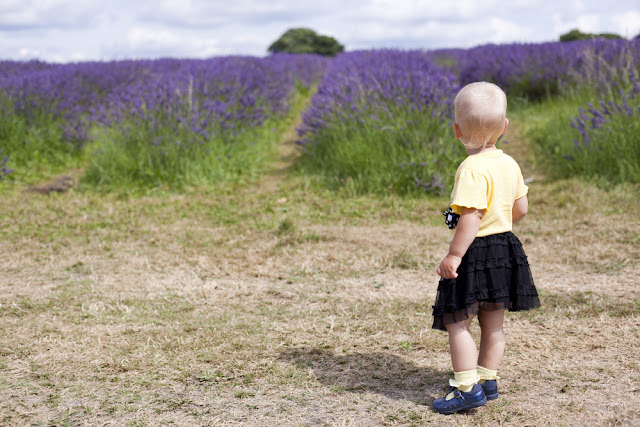 I love lavender but have never been to fields like those. Oh I so want to do this! The photos are beautiful and Lily looks like she's having so much fun! Lavender fields really are beautiful, I don't think there are many near me to go and explore though! Lily looks so adorable in her bumblebee outfit, the yellow contrasts the purple flowers which really make you photographs look beautiful. It's fab that even after the terrible journey there you had a wonderful time with Lily, made a new friend and managed to even grab a couple of souvenirs.